This is a surname of medieval English origins. It is a locational from a place called Hartland or Hartland Point on the north coast of the county of Devonshire. Recorded as Heortigtun in the Anglo-Saxon Chronicles of the year 880 a.d., as Hertitone in the famous Domesday Book of 1086, as Hertilanda in the year 1168, and as Hertilaund in 1230, the original derivation is from the pre 7th century Olde English "heorot" meaning "stag", with "-eg", an island, later -tun", a farm or settlement, and finally "-land", meaning an estate or property of some size. Locational surnames were originally given either to the local lord of the manor and his descendants, or as a means of identification to those who left their place of origin to settle elsewhere. The surname is first recorded in the latter half of the 13th century, being that of Abbas de Hertilaund. This is dated 1273, in the list of the land owners of the county of Devon. Later examples taken from surviving church registers of the 16th century onwards include Rowland Hartland, christened at St. Andrew's church, Plymouth, on August 10th 1595, whilst on July 25th 1626, Thomas Hartland and Anne Pope were married in London. 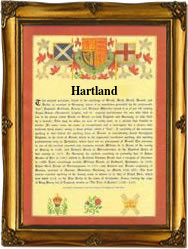 A coat of arms granted to the Hartland family of 'The Oaklands', Devonshire, has the blazon of a silver shield with three gold bucks' heads erased, on a black bend. Surnames became necessary when governments introduced personal taxation. In England this was sometimes known as the Poll Tax. Throughout the centuries, surnames in every country have continued to "develop" often leading to astonishing variants of the original spelling.